The Station Hotel and its almost identical partner, The Randolph in Wangford Road, Reydon, were designed by local architect, Thomas Edward Key for Adnams Brewery in the early 1900s.The Station Hotel was planned specifically to serve passengers of the Southwold-Halesworth Railway but changed its name to the Avenue Hotel shortly after the First World War even though the railway continued until 1929. 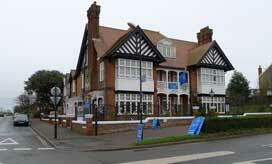 It has undergone two changes of name since: Pier Avenue Hotel and, more recently, The Blyth Hotel. Note: Thomas Edward Key (1864-1911) was brought up in Leiston and studied at the Architectural Association in London where he won awards. His practice was mainly focused on the Suffolk coast and he maintained offices in both Southwold (No 1 Market Place) and Aldeburgh. As well as the Station and Randolph Hotels, Key also designed Southwold Hospital. He also accepted some private commissions for large, detached houses in central London. He designed the Constitutional Club in Leiston, elementary schools in Saxmundham and Carlton Colville and oversaw church restorations at Peasenhall and Dennington. His obituary suggests that he also designed several Arts-&-Crafts-inspired houses in North Suffolk but these remain unattributed. We are grateful to Alan Hatfield of Leiston for supplying details of Thomas Key's career. Note: Richard Shaw goes on to run the tobacconist and confectionery shop at No 1 St James Green, in partnership with Walter Rockall who has retired from trading at No 5 Trinity Street. 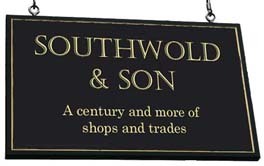 Richard & Charlie Ashwell - Proprietors, The Blyth Hotel. The Construction of the Sation Hotel photographed in about 1900 from the Railway terminus. Blyth Road can be seen on the right. Click the picture for enlarged views. 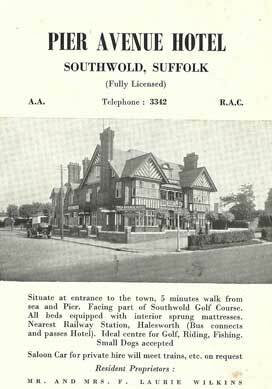 1921 advertisement in the Southwold Golf Club Handbook. Although the railway station was still very much in operation just across the road, the proprietor obviously considered that there was little tourist appeal in the name 'Station Hotel', preferring to associate it with the Pier, the Common and the Golf Links. 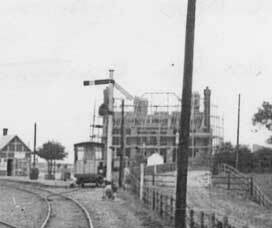 1930 and the Railway is now closed. The new proprietor is firmly focusing on the hotel's commanding position at the top of Pier Avenue, the prime access to Southwold's seaside attractions. 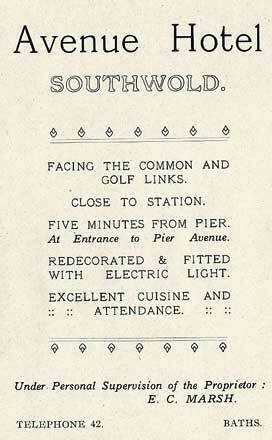 Reproduced from an advertisement in The Southwold Golf Club Handbook of 1930. 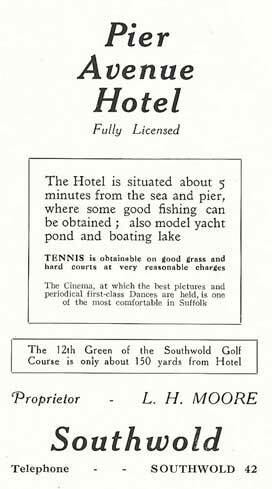 A 1960s advertisement reproduced from the Southwold Golf Club Handbook. With thanks to Helen Osmer for providing the above advertisements. With thanks to David Baker for this image. 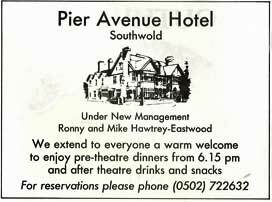 1992 advertisement in the Southwold Summer Theatre programme soon after it had changed management.